Located in the Sierra de Gredos mountains range, Gredos is directly west of Madrid. The mountains spread across an area of 100 kilometres and is hugely popular with serious hikers and climbers. It also offers downhill and cross country skiing during the winter months as its highest peak, the Pico Almanzor, reaches 2,592m so most of this range is covered in snow at that time of the year. There are three specific areas that normally attract the tourists in this part of Spain; the Sierra de Gata near the border of Portugal, the Sierra de Guadarrama further east in the Madrid province, and the Sierra de Gredos which is south of Avila. If you want to ensure warm weather though midsummer is usually the best time of year to go, as it can still get quite chilly in the mountains during spring and autumn. The Sierra de Gredos however can get very hot in the summer, although it tends to be less crowded despite having the better tourist facilities. Besides its beautifully contrasting peaks, there are also stunning waterfalls and glacial lagoons. It is simply packed with various beauty spots, and there are dozens of outdoor activities to take part in if you prefer the more active type holiday. These activities include hiking, mountain biking, canoeing, river rafting, climbing, assailing and horseback riding. For those who enjoy observing the wildlife or bird watching, there are also a number of tours you can join to learn more about this stunning area. On a good day you might see anything from the Spanish Ibex, which is a long horned wild mountain goat, to griffin vultures and golden eagles. In the spring it is awash with colour from the flora in bloom to the vibrant variety of butterflies. At the turn of the 20th century there were only about 20 Spanish Ibex left, as this part of Spain used to be royal hunting grounds. However, in 1905 it was declared a protected area by King Alfonso XIII who thankfully had the foresight to realise they would soon be totally wiped out if he did not act quickly. Hunting was eventually banned altogether, and today the population of Ibex stands at over 5,000. King Alfonso XIII originally chose Gredos as the location for a hunting lodge and inn. 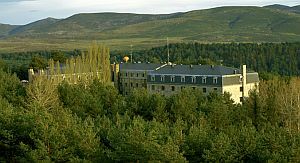 The lodge then became the very first Parador, the Parador Hotel Gredos, with marvellous views of the mountains and the Tormes Valley. It is a truly fantastic place to base yourselves while you are visiting this region, as it is not only elegant and comfortable but also has a superb restaurant serving excellent regional dishes. For those who enjoy riding, there is an opportunity to hire horses in Gredos itself and explore the many trails through the mountains on horseback. Or if you prefer to walk, many of the routes will either take you up to the top of the peaks, or towards one of the glacier lagoons. But whichever way you choose to explore the mountains, along the way you are very likely to pass others doing anything from fly fishing for trout in the River Tormes to the paragliders who take off from the peak near Piedrahita. However, if it is a complete contrast you wish from this most serine environment, the city of Madrid is only an hour and a half away by car. You will also be within each reach of several fascinating ancient towns with an interesting history, such as Avila and Salamanca. So there is no doubt if you base yourself in Gredos you will be able to enjoy the best of both worlds.